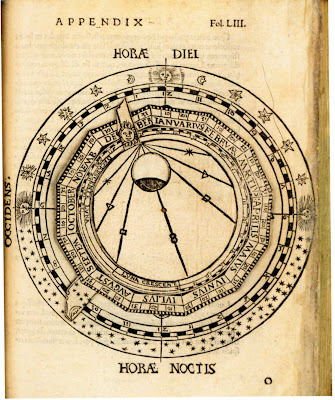 My stats say that a few people landed here recently after Googling “how to make a volvelle.” I guess volvelles are gaining in popularity. I’ve mentioned them before, but not how to make them. However, I have taught a workshop on making one without a brad or other hardware. Google suggests, and I will offer. It looks long and intimidating, but this is actually pretty easy once you get the idea. I’m just wordy. Heavy paper or card stock. X-acto knife or scalpel with sharp blade and cutting mat. 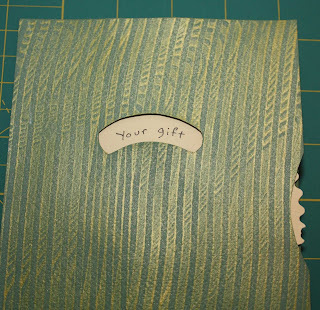 Optional: tracing paper, large hole punch or circle template, Tyvek. A ruler or straight edge can be helpful. 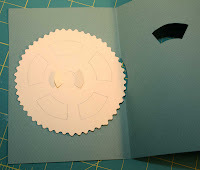 For our example, we’ll use a piece of heavy paper or card stock folded into 3 panels to make a card, and a separate piece of card stock for the wheel and turning mechanism. Open the card. Using a compass, measure a circle that will be just a bit smaller than the width of the page (one of the sections)–but don’t draw a circle here. 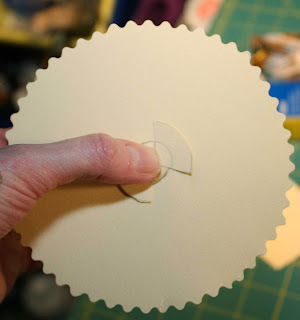 Lift up your compass and draw this circle on the piece of card stock that you would like to use for your turning wheel. Place the point of the compass in the indentation left in the middle from making the bigger circle and draw this smaller circle in the center. You are making a small circle centered inside a big circle–a donut shape. If you’d like you can use something like decorative edge scissors around the outer edge of your donut/wheel. This will make the wheel easier to grasp when your are trying to turn it. 3. Make the turning mechanism/hub. 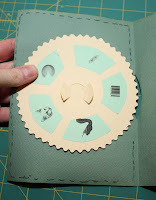 Keeping the compass measurement exactly the same as from the inner, small circle on the donut, draw another little circle elsewhere on another sheet of card stock. (Or, cheater’s method: simply trace the small hole from your wheel. Now increase the compass size to make another circle roughly .5″ larger than the little circle you just made. Draw this around the smaller circle. You should wind up with two nested circles. 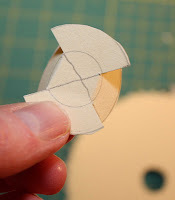 Cut out around the outside edge of the larger, outside circle. 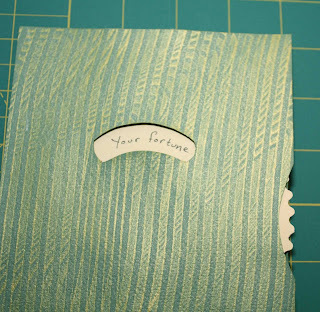 What you are creating is the hub that is going to hold your turning wheel in place and allow it to spin–sort of a big paper version of a brad. Now make an X across your nested circles to create a guide. Cut 4 slits from the outside circle just to the inner circle (see photo at left). This will allow you to form two tabs on either side. 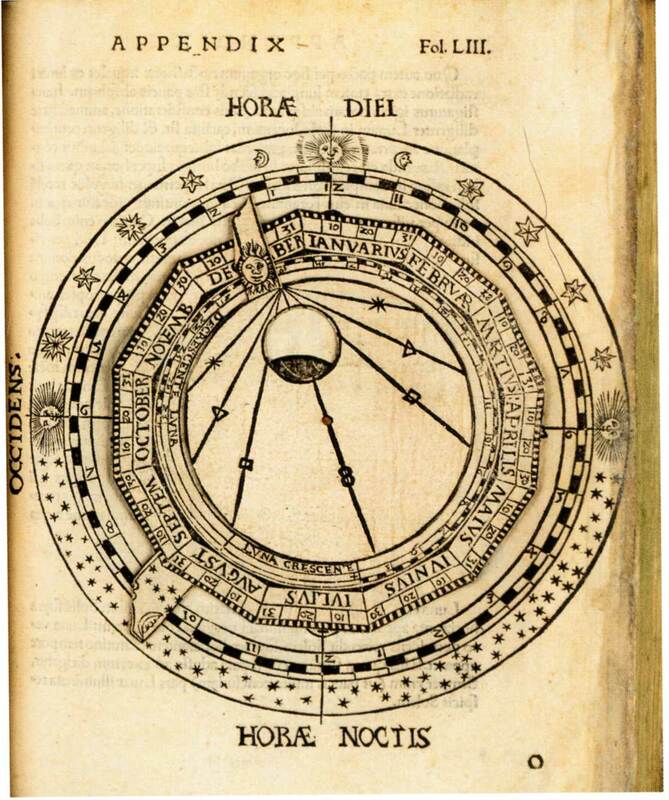 If the slits you cut are too big, your volvelle will wobble. If too tight, it won’t spin. 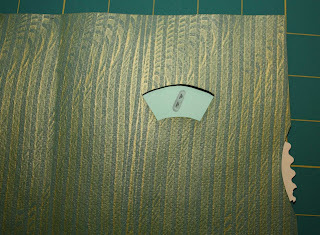 Now fold up two opposite ends to make tabs, as shown. Rolling these tabs a bit as needed, slip them through the hole in the center of the wheel, then flatten down. Check to make sure the wheel spins properly. 4. 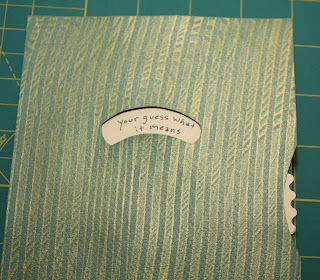 Make a space at the edge of your card so you can turn the wheel. 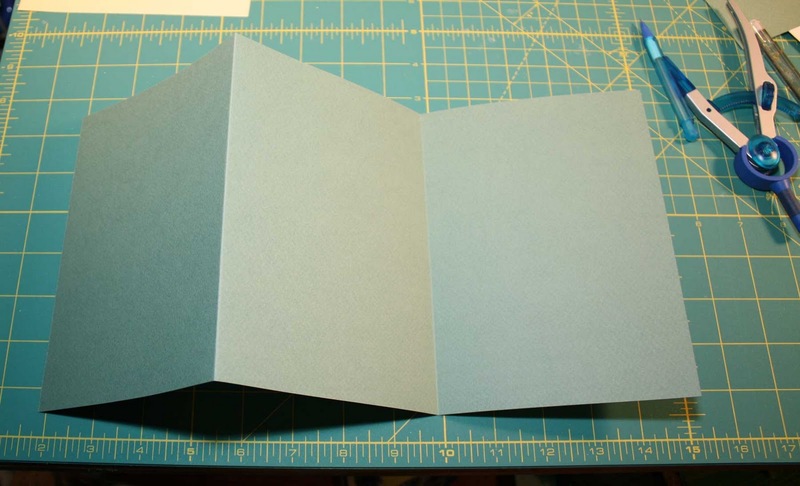 You need to make a little space at the edge of the card (or page) for your fingers. 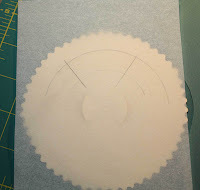 You can use the edge of a large circle punch or stencil. 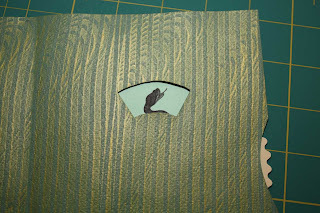 Or you can center a little cut out section at the edge of the card. The photo below is the idea. Don’t make the opening too deep, or the pictures or text that you add to the wheel will be visible in this opening as you turn it. You want enough room to allow you to grasp the wheel, but no more. Position the wheel on your card stock. It won’t be exactly centered, but will overlap the edge a bit, matching up inside the slit/opening you made. Lightly mark around the wheel so you will know where it will be attached. Now remove it and put a small amount of PVA or strong double-sided tape on the back of the hub only (don’t get glue on the wheel itself or it won’t turn). Position into place. 6. 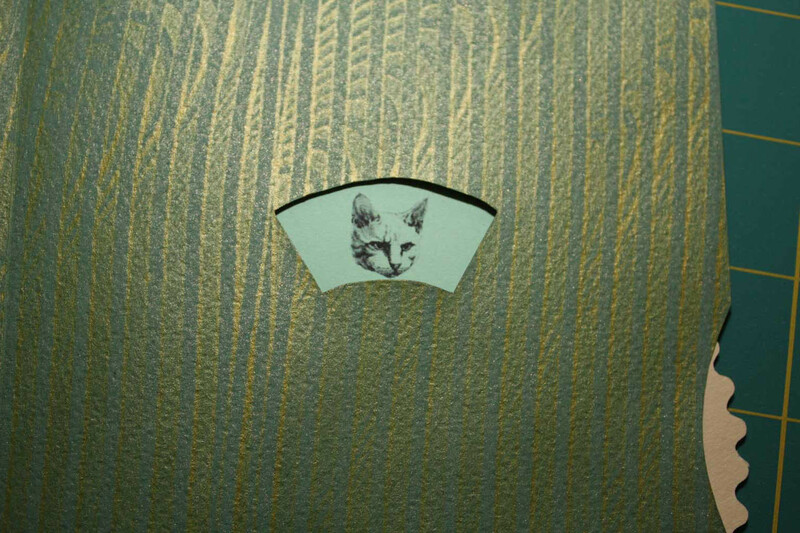 Make the window on the front of the card. There are many ways to make a window. You can use a stencil or a hole punch, measure an opening where you’d like it, or even make an irregularly shaped window. You just want to make sure–very important–that the hub tabs or edge of the wheel won’t show through where you make your opening. 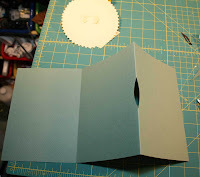 Keep in mind that this can also be a two-sided structure if you also put a window (or windows) on the other side of the card or book page. Here is a method for making an arched window. Keeping in mind the position of the wheel and hub and tabs (so you can be careful to avoid having them show through), mark where you’d like your window. Follow the contour of the wheel edge as a guide. You can use the compass as an aid. Remember doing this in school? 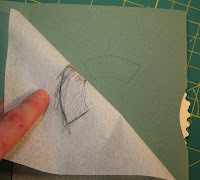 Turn the tracing paper over and trace in pencil over the window you just made. Turn this back over onto the front of the card and rub with a pencil or burnisher to transfer the markings. 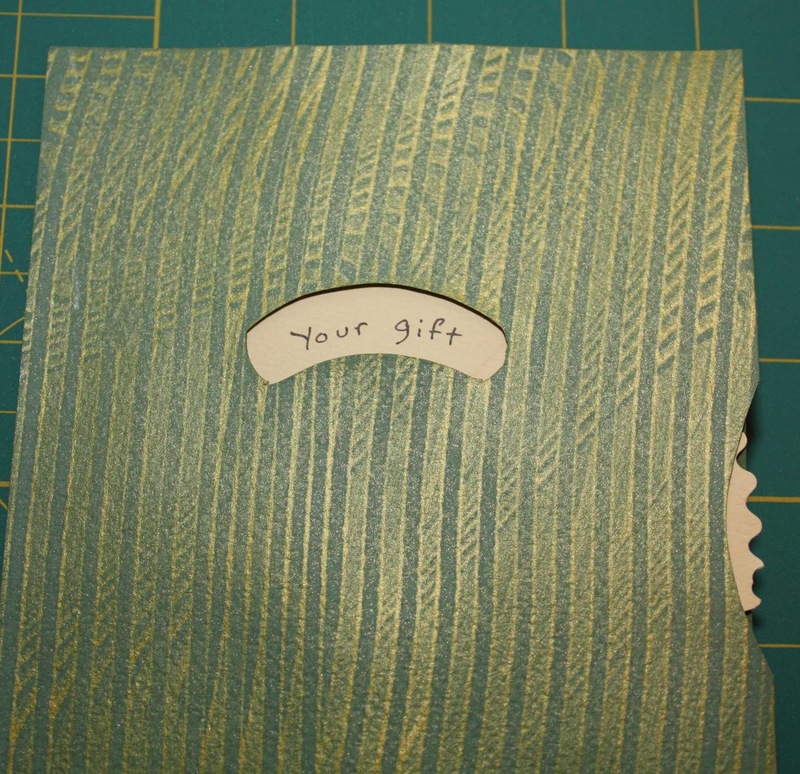 With the card open, cut out the window. It helps a lot if you lightly trace around the window opening onto your blank wheel as you turn it, showing where you’d like to add your pictures or text. Once completed, seal the card using a small amount of glue or double-sided tape along the edges. Be very careful not to get any glue or tape on the wheel. If you do, you will have a stationary wheel, rather than a turning one. The dotted lines show where you can put the adhesive. If I was planning to make anything fancier than a casual card, I’d lay out the wheel pictures on the computer and print them out directly on the wheel. Even when doing this, it sometimes makes it easier to use a wheel with window tracings as a template to scan and work over. You can erase the window markings in your photo or graphics program before printing. 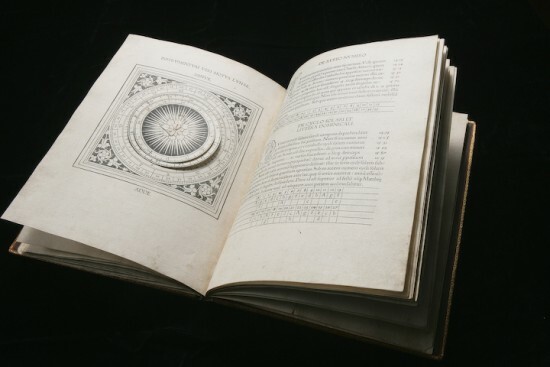 If you’d like a volvelle that is simply a turning disk (or other shape) on top of a page, without a window, simply make a hole the size of the “donut hole” in the card front. 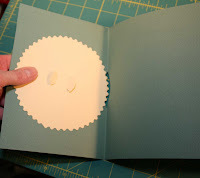 Thread the tabs of a hub through, and glue your disk or shape onto the tabs, on top of the card. The hub mechanism forms the basis for many animated paper engineering structures. Books and websites on paper engineering can lead you to more. 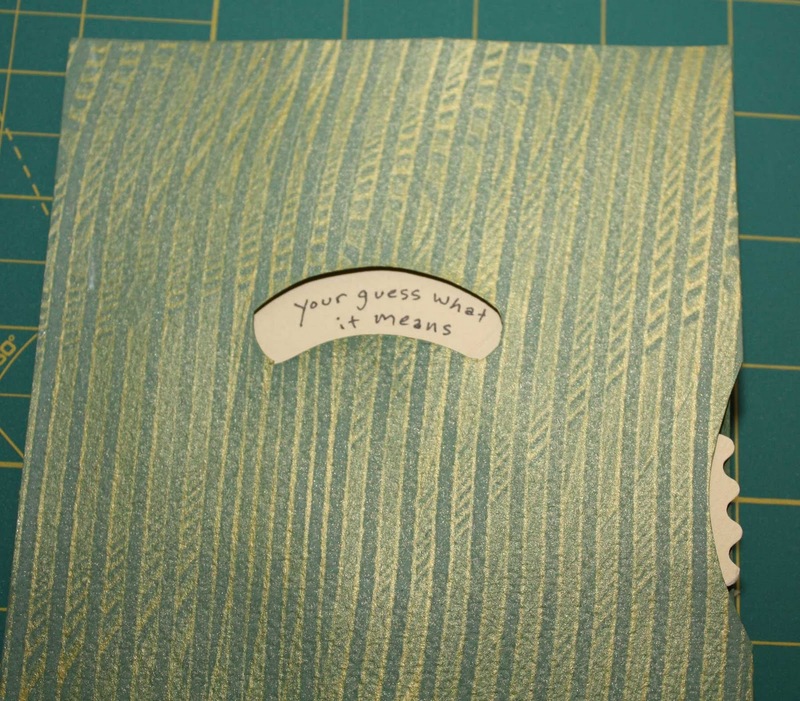 Alisa Golden shows a similar volvelle in her new Making Handmade Books. She suggests using Tyvek for the hub. I haven’t tried this yet. She also uses a much smaller hole. I can see how Tyvek, being stronger and more pliable than heavy paper, would make using a smaller hole feasible. This sounds like something to experiment with. 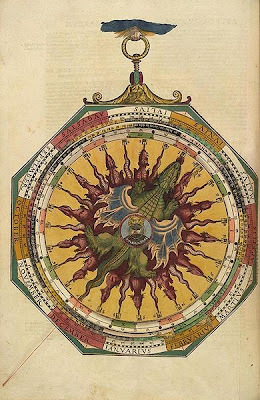 Volvelles are paper wheel charts with rotating parts. The modern ones, such as those reproduced in Jessica Helfand’s Reinventing the Wheel, are enjoyable. But there’s something so captivating about the ones from previous centuries that were incorporated into books. These were used for serious stuff like astronomy, medicine and fortune-telling. They were computing devices in their day. To think that the modern movable book has such exalted ancestry. 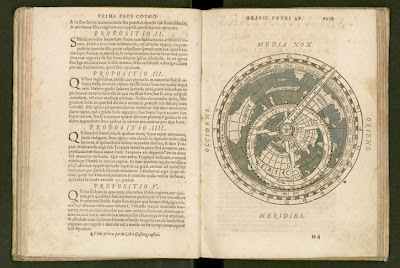 When I posted a picture recently of a volvelle from Petrus Apianus’s 1529 Cosmographia, it whetted my appetite for more. 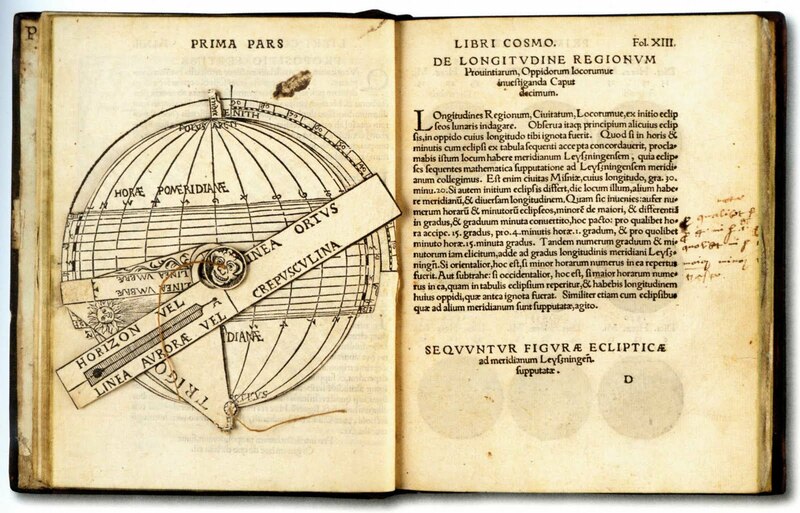 Here are a couple of other examples from the Cosmographia. 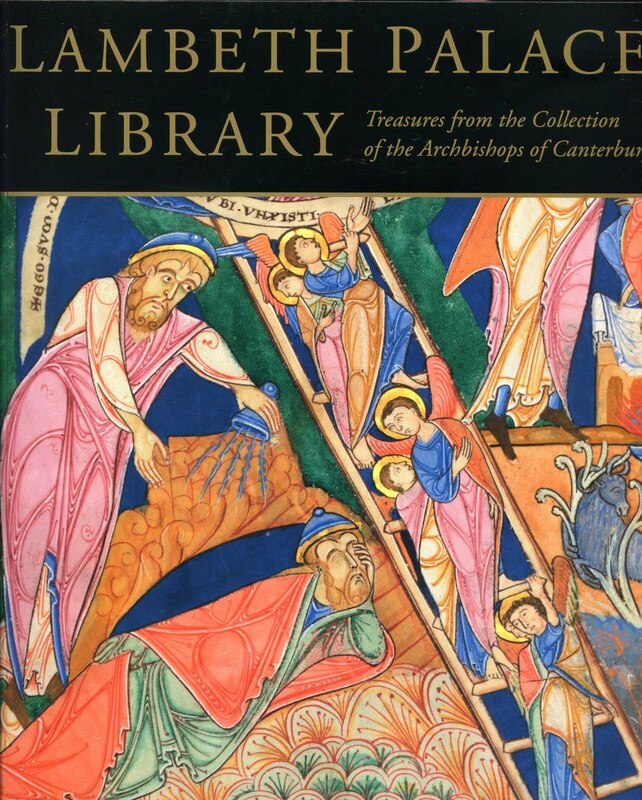 From the Lambeth Palace Library Exhibition catalogue. A spread from the Library of Congress website, showing the positions of the sun, moon and planets. 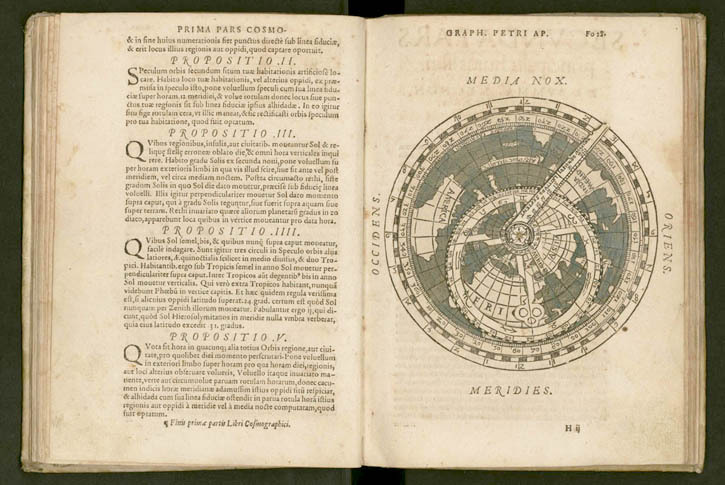 According to the Lambeth Palace Library Exhibition catalogue, Petrus Apianus (1495-1552) was a mathematician and a pioneer in astronomical and geographical instrumentation. 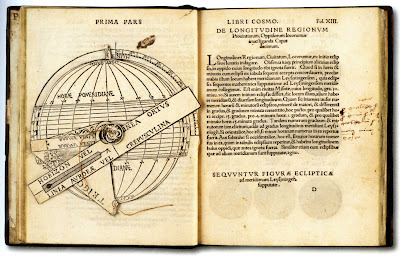 The Cosmosgraphia was a European best-seller. It appeared over the next century in as many as 45 editions in 4 languages, printed in 7 cities by at least 18 printers. 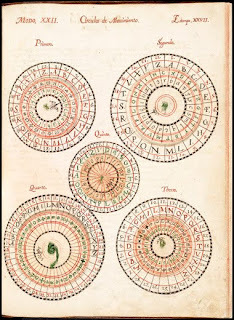 It contained four volvelles. 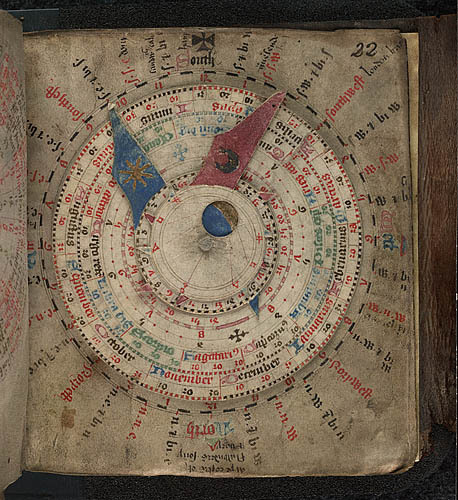 Volvelle from “Medical miscellany, including an astronomical calendar” (approx 1490).The British Library. Doesn’t it just make you want to start cutting and assembling circles (or at least drool over photos of old manuscripts)?